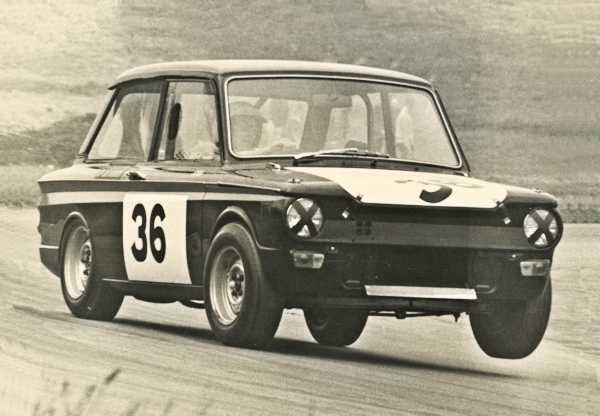 John Calvert raced an 850 cc Imp in 1968 and 1969. According to his brother Steve [2-Mar-2011], John mainly contested the TEAC races in '68/'69 based mainly at Lydden, but also at Brands Hatch and Snetterton. He started his circuit racing with the Imp, then went on to race a Royale RP4 in the F100 championship then a Huron 4A in Sports/GT. Being a salesman for Rootes/ Chrysler, he was able to secure a few drives of the works Imps in 1967 for sprints and hillclimbs before embarking on his circuit racing career. Steve [3-Mar-2011]: I know that he had a few class wins. In the meantime here is a picture of his car in 1968. The colour is black with metallic green side flashes. For 1969 there was white Minilite wheels with a white roof. John was in motor sales at different Rootes/Chrysler London salesrooms, including Warwick Road, Ladbrook Grove, and Halkin Street.